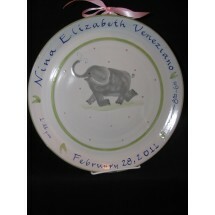 All of the Birth Pieces shown in this section are special order and personalized with the child's name, birth date, weight, height, etc. When ordering your pottery, click on the desired piece of pottery, select a desired children's pattern, and fill in the personalization fields with the child's information. Please allow approximately 4 to 6 weeks for delivery of your special piece. 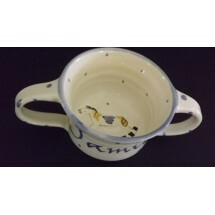 All our pottery is handrafted in Dorset, Vermont. 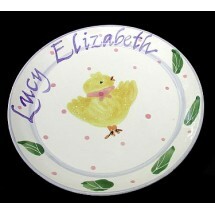 Our personalized line of childrens pottery makes a wonderful birth gift and a lifetime keepsake. 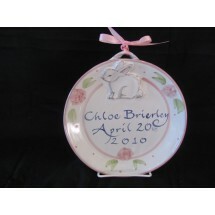 If you are looking to purchase childrens pottery quickly, we suggest you visit our In-Stock Birth Baby Gifts on this website to see if you can find what you are looking for. Our most popular custom piece, these personalized ceramic birth plates make a classic keepsake th..
Personalized ceramic 11.5" birth plates make a classic keepsake that can be treasured for a lifet.. 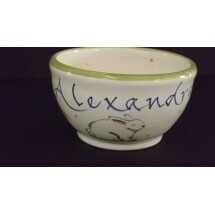 The ceramic child's bowl is personalized with your choice of children's pattern and with your chi..
Personalize the Baby Birth Clock with the child's name and date of birth for a truly special gift..
Personalized Child cup with your choice of childrens pattern and child's name. 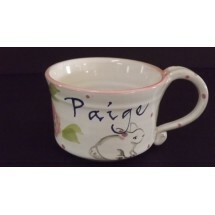 Your child will lo..
Personalized Child mug with your choice of childrens pattern and child's name. Your child will lo.. 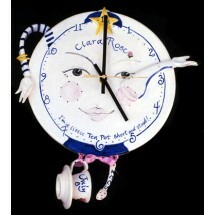 The 9" ceramic child's plate is personalized with your choice of children's pattern and with your.. 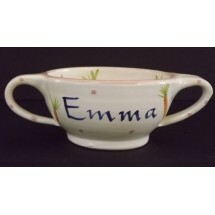 The hand-painted double handled child's porridge bowl is personalized with your choice of a child..